I'm coming back into orbit of the blogosphere now, after my week of cycling then the first week of teaching and the end of student enrolment (arrrgh!) My neck's also been pretty stuffed from the ride (probably all that pushing of a loaded bike up hills) so I've been trying to avoid the computer in my down time. Anyway, I thought I might ease my way back by talking about some of the books I've been reading, tho strictly speaking, I won't be attempting proper reviews here, just 'shorts'. When I went away, I thought I might do some re-reading of books I hadn't read in years. This is always a bit difficult, what with time being at a premium when you both work and try to write: I feel I should be using my time to chart unread territory. But I don't think re-reading is a totally unwasted endeavour, especially if they're good books you're reading. Last year, I was talking with a friend who's written and published a novel, and has since embarked on a non-fiction work. We were talking about what it was that publishers might be wanting at the moment, and she told me that the days of the quiet novel were largely over. Publishers were looking for something new, she suggested -- or maybe something old-new, like novels by another Tim Winton, bubbling over with likable, saleable, farting, folksy Australian characters. Actually, that's probably all a bit harsh, but I'm hoping you'll get the general drift. I'm not going to give any examples, for fear of causing possible offence. And I'm not bringing Tim Winton any further into this, either. I think the 'noisy' versus 'quiet' novel axis should also be distinguished from another much chewn-over cud, the need for more 'political "now"' novels as opposed to the surfeit of supposedly 'apolitical "back then"' (i.e. historical) novels. 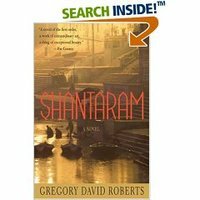 In looking for possible eruptions of noisy narratives, I'd like to suggest that Gregory David Roberts' Shantaram provides a new take on the Australian novel. Shantaram is a noisy, baggy monster of a creation: tho linked to a central protagonist's quest, it spans multiple characters and continents over a large time period, and juggles long, unwieldy plotlines. While written in novel-form, it draws apparently on Roberts' life experiences: a convicted prisoner, he escaped from a maximum-security facility in Victoria to New Zealand, and then to India, where most of the novel is set. Whilst on this odyssey, he established a free-medical clinic in a Bombay slum, worked as a counterfeiter, a smuggler, a gunrunner, and a foot-soldier for the Bombay mafia. Not surprisingly, Shantaram is also very long: in the tradition of the Victorian and some pulp fiction novels, it is a book that goes thump on the desk. My first thought on seeing its bulk was: who can have had the time to write such a tome? My second was: aha, someone in a prison CW program. That said, while Shantaram can be read as a form of pulp fiction, an action thriller in the order of Wilbur Smith or Tom Clancy,* it can also be placed as a form of contemporary hyper-realism and has antecedents in the Victorian novel. ...it's a kind of hyperrealism. There's painting like this where so much is put in so exactly. Too much information, you know, too much detail: every dog, every hair on every dog, and every nail on the dog's toes. Hyperrealism can create an atmosphere of surrealism because nobody sees the world in such detail. Shantaram arguably suggests a populist form of hyper-realism with its manic, yet well-managed cast of characters and subplots, and its overabundance of descriptive detail -- particularly in servicing the main character's consciousness. It's unafraid of exposing its heteroglossia, and what more perfect heteroglossic subject could there be than India? Which brings me to another subject. Like some post-colonial writers (Seth and Smith come to mind), Roberts draws on the tradition of the C19th comedic novel, specifically Dickens. The central protagonist's journey through the slums of Bombay to the getting of a certain life wisdom is particularly suggestive of the narrative of Dickens' Great Expectations. Like Pip, the protagonist Lin is in love with his mentor-antagonist, Carla (=Estella), who has reached a level of knowledge and facility in a social-strata which he wants to attain. Carla's own initiation into this culture is blackened by her own experience with Madame Zhou (= Miss Havisham), a highly-manipulative brothel owner whom no one is allowed to view directly. Lin must rescue Karla -- and other proxy damsels -- from her influence, etc. The mode of characterisation in Shantaram is also highly detailed in a Dickensian way: while particular attention is given to its delineating main characters (often in elaborate), there are many, idiosyncratic 'flat' characters in its highways and byways. Okay -- some minor major quibbles about Shantaram: in my discussions with others, there are two main areas of objections to this book. The first is that Gregory David Roberts, or his swashbuckling narratorial persona at least, seems like a raving egomaniac: oh well, probably only an egotist could handle such a complex, lengthy narrative. The second is that Shantaram is full of purple prose: only too true, alas. An editor is mentioned somewhere in the acknowledgements: it seems a shame she didn't delete every second page, every second sentence, every second word, etc. Roberts is at his worst when his main character's in love but there are other passages like this. It's like the old conundrum: often the more aware you are of Trying to Write, the worse your writing becomes. And it's maybe not exactly what I was hoping for in a new tradition of Australian hyperrealism. Otherwise -- characters are sometimes flat and pasteboard-y, especially the women, in the manner of some Victorian novels and much pulp fiction. The world of Shantaram is full of goodies and baddies. But there's a lot of action. Things happen. In some ways, I don't feel well-placed to be commenting Shantaram or the problematic of contemporary Australian writing as (1) I haven't made a comprehensive study of recent Austlit novels and (2) it's almost six months since I read Shantaram, while on a long-haul flight (some might argue this is the only way of possibly getting through Shantaram). But I'd be interested to know whether others have had similar thoughts on Shantaram or the idea of a quiet versus a noisy novel. Or just on Australian hyper-realism -- do we have a tradition of hyper-realism to speak of? Is it worth jumping on the hyper-realism bandwagon? And if you're interested reading in Shantaram, pack it for your next long-haul flight.